Tomorrow night, the Yankees face off in a win-or-go-home game against the A’s. In these types of games, it can come down to one or two at-bats and every single matchup is important. It is essential that the best pitchers are used, and that they are used in optimal matchups. With that in mind, I wanted to take a look at how the Yankees should matchup against the A’s best hitters. 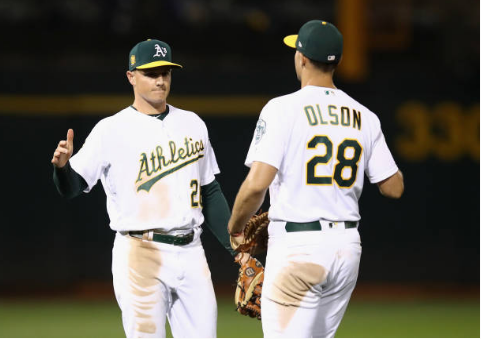 Two of the most important batters on the A’s this season were the Matt’s: Olson and Chapman. Olson is a left-handed first basemen who hit .247/.335/.453 with 29 home runs. Chapman is well on his way to becoming the best third basemen in the game through his defense, but he can hit as well. This year he hit .278/.356/.508 with 24 home runs. Let’s break down their batted ball preferences and tendencies and see who on the Yankees will match up well with them. According to Fangraphs pitch info pitch values, Olson surprisingly struggles against fastballs and feasts on off-speed pitches. Against fourseam fastballs, Olson’s wFA is -4.0 which means that he is four runs below average against the pitch. On the flipside, he is 6.9 runs above average against sliders and 1.5 runs above average against curveballs. Olson also tends to struggle with pitches higher in the zone and feasts on pitches middle-away. Again, you see the struggles against pitches up in the zone and strong production on pitches lower. Chapman does have a strong platoon split, and for that reason, Bob Melvin will pinch-hit Mark Canha for him against a lefty pitcher. Thus, we should only consider righty pitchers against Olson. Based on his tendencies, I think Chad Green is the best option because of his success on high fastballs. Green will have to stay away from using his slider, though, because Olson is amazing against those pitches. I worry about Dellin Betances’ command against Olson because if he misses in the zone and the pitch ends up middle away, Olson can do a lot of damage. 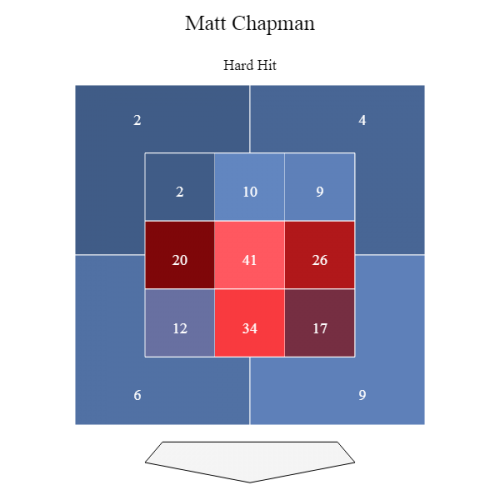 David Robertson seems like a poor option for this matchup because he tends to stay away from the upper parts of the zone. Therefore, Chad Green is likely the best option. 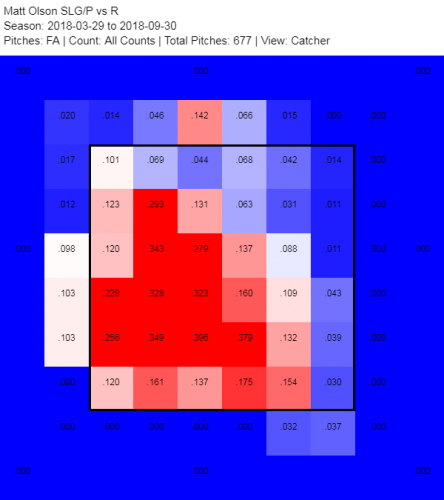 This heat map from Fangraphs shows runs above average per 100 pitches broken down by location. The red zones indicate better performance, and the blue zones are where he struggles. You can see he fares poorly against pitches low and in as well as up and away. 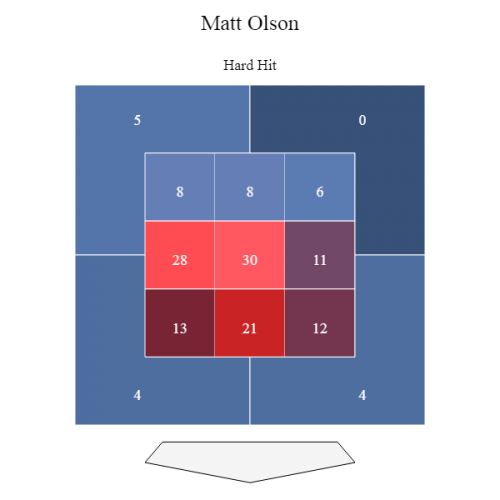 This chart from Statcast shows Chapman’s hard hits per zone. Again, you see how he struggles against pitches low and in and up and away. The pitcher on the Yankees best equipped to take advantage of these holes is David Robertson because of his pitch combination. 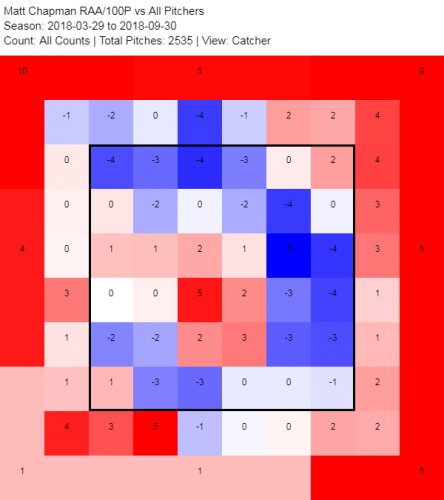 Robertson has a cutter-curveball combination which according to the pitch info data should work well against Chapman. Moreover, Robertson can locate the cutter up and away and has the command to keep the curveball in or below the zone. The A’s offense definitely presents a challenge to the Yankees pitching staff. In a game like this, it is imperative that Aaron Boone mix and match properly to ensure that pitchers are put in positions to succeed and exploit batter’s weaknesses. If the Yankees are able to plan out when each pitcher will pitch, they will be primed to succeed tomorrow night.